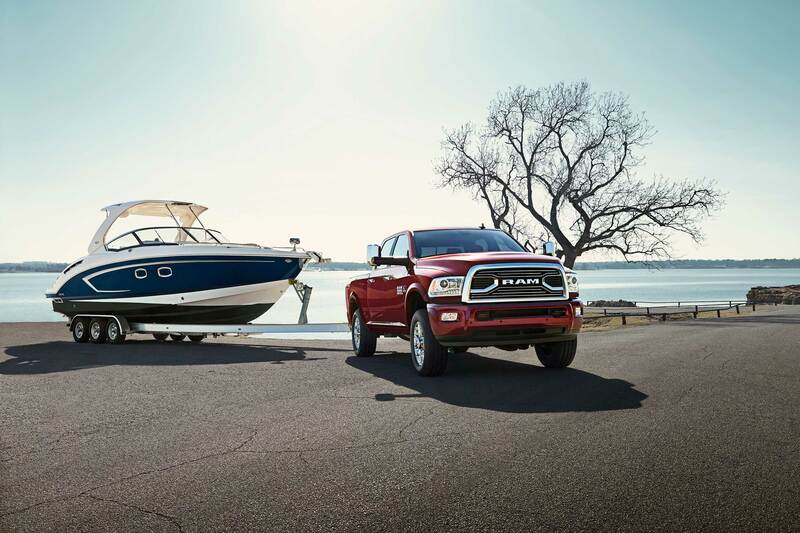 There’s more to towing than just raw power, though that certainly helps. To be a good hauler, the truck’s transmission must be able to transmit all that power without overheating. The axles need to be able to carry the weight, with ratios chosen to maximize pulling power. The suspension has to control the load while still providing a decent ride. The weight of the truck matters. Almost counter-intuitively, a lighter truck can pull more than a heavier one, all else being equal. With less weight to begin with, more power can be applied to the load. Traditionally, manufacturers named their trucks according to carrying capacity, such as 100 for the half-ton model, 200 for the three-quarter-ton, and 300 for one ton. Today’s trucks are far more capable, but tend to use the similar conventions, such as Ford F-150, Ram 2500, and Chevy Silverado 3500. To compare towing capacity across models, we have grouped the trucks on sale in the U.S. into mid-size (the smallest size available), full-size, heavy-duty, and ultra-duty. We then loaded them up with the best engine choices and towing package for the job. Please note that as-built prices may vary. 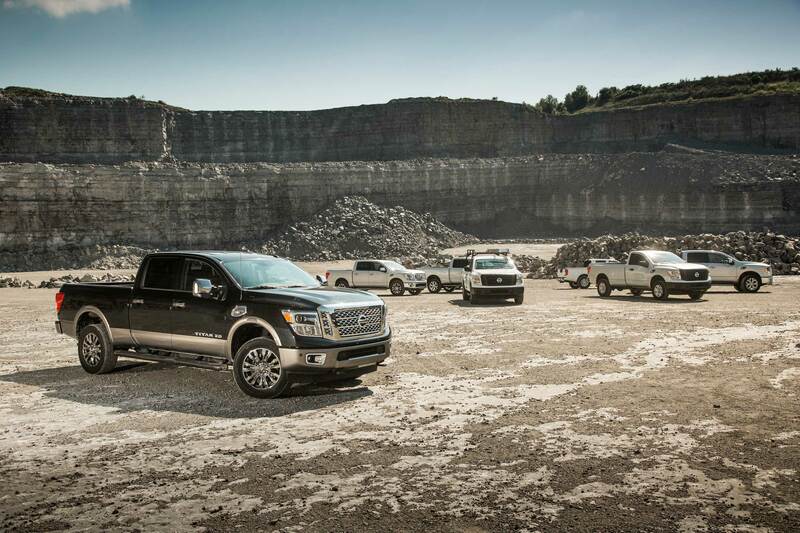 After years of neglect, the mid-size truck segment is heating up. 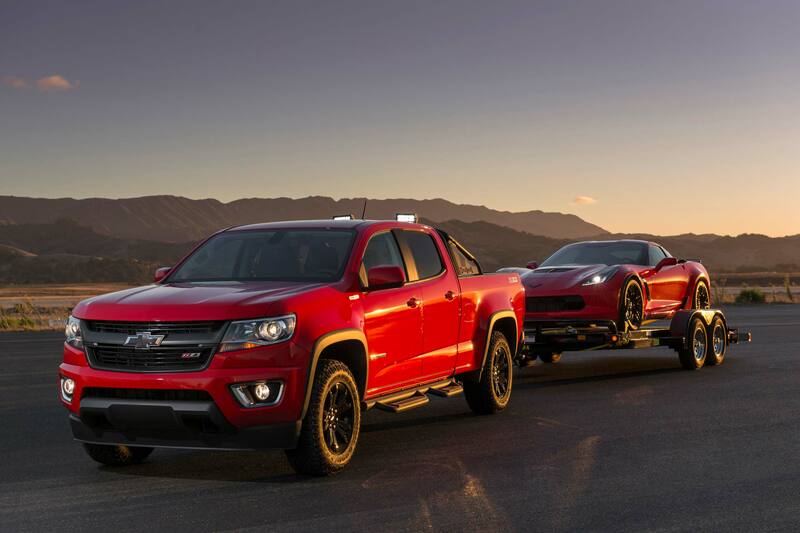 Chevy’s decision to release the Colorado in 2014 seemed to reinforce public interest. GMC followed suit with the Canyon, Ford is bringing the Ranger back this year, and even stoic Nissan has hinted that the Frontier will (finally) be updated next year. These fun-sized trucks may be smaller in size that their bigger counterparts, but they’re still capable of working for a living. They’re generally used for towing weekend toys, like small campers, motorcycles, and personal watercraft. 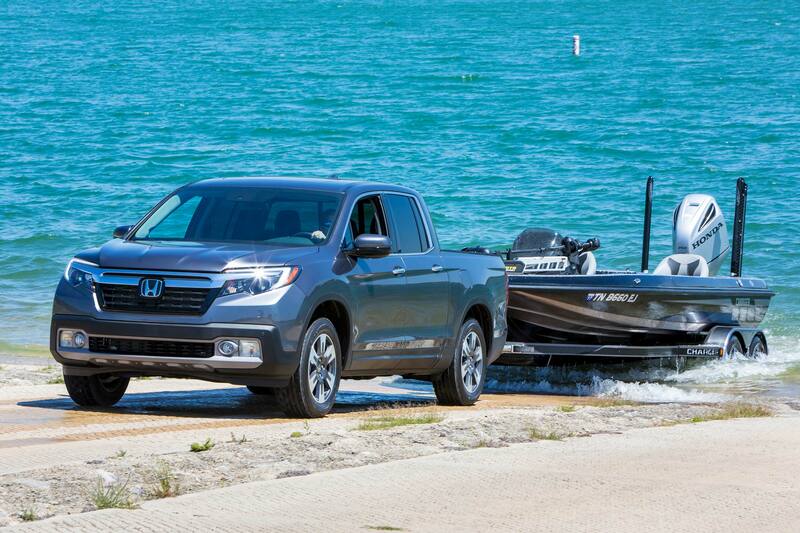 While its size groups it in with other small pickups, the Honda Ridgeline’s unibody construction puts it in a class of its own, giving it a decidedly civilized and car-like demeanor. One engine is offered across the model range: a direct-injected V6 with 280-horsepower and 262 lb-ft of torque. A button-operated traction management system keeps the Ridgeline moving forward in snow, mud, or sand, and of course on normal roads. Two-wheel drive versions will tow a maximum of 3,500 pounds, while selecting all-wheel drive (AWD) ups the ante to 5,000. AWD models come with a heavy-duty transmission cooler, and all models come standard with an integrated tow hitch and 7-pin connector. The first model with AWD availability (a $1,900 option) is the Sport ($35,290). Nissan has confirmed that a new Nissan Frontier is coming, but not for another year. Until then, we will soldier on with the current generation, introduced in 2005 and updated in 2009, with a fuel economy upgrade in 2013. Even fully maximized for towing, the stalwart Frontier offers the lowest price point in the segment. Our hauler of choice is the rear-wheel drive (RWD) King Cab SV with the optional V6 ($25,220 total), good for 6,710 pounds. A Class IV tow hitch receiver can be factory installed for $230, and a Class III hitch and ball for an additional $84. A 7-pin trailer harness is $66, while the 4-pin is $51. Towing brake sub-harness? $26.68. We do like the optional weight-distributing hitch ball mount, though it is a bit spendy at $370. Toyota’s dauntless Tacoma SR5 will pull an admirable 6,800 pounds when equipped with the 278-horsepower V6. 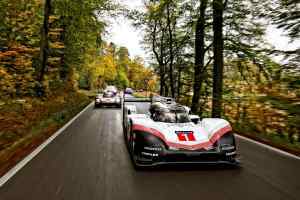 The engine makes 265 lb-ft of torque and is paired with electronically-controlled automatic transmission with overdrive and a limited-slip rear differential. 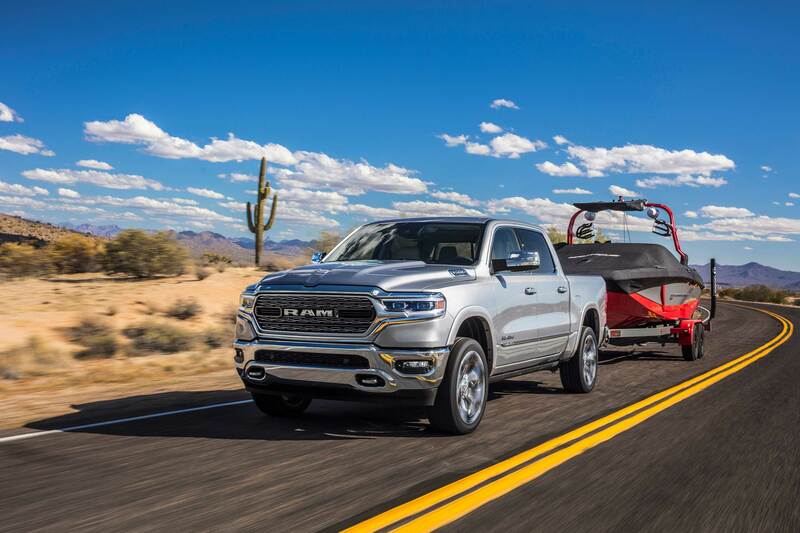 Also included is the towing prep package with extra cooling for the engine, transmission, and power steering; a 130-amp alternator; a class-IV towing hitch receiver; four and seven-pin connector with converter; and trailer sway control. 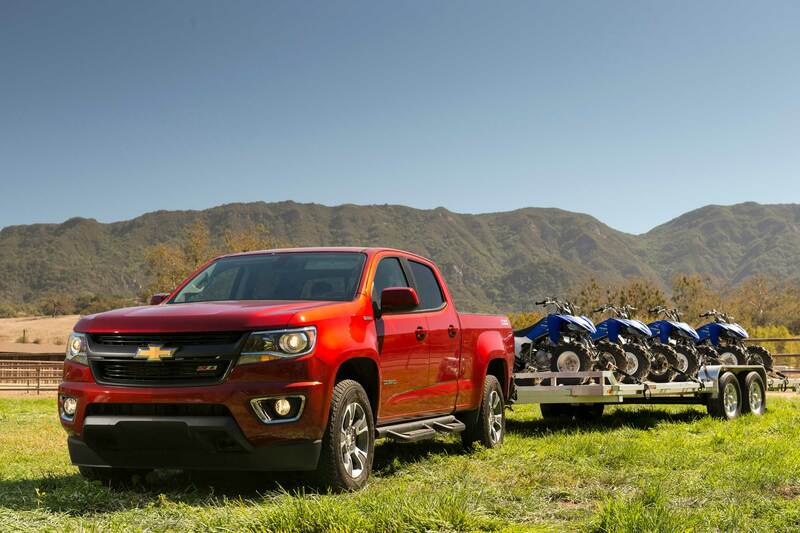 In base form, the Chevy Colorado’s 2.5-liter four-cylinder engine has enough power to comfortably trailer and motorcycle and enough gear for the weekend. For really big jobs, though, it’s time to step up the LT with the optional 2.8-liter Duramax turbodiesel under the hood ($4,965). With 369 lb-ft of torque available, there’s more than enough grunt to get things moving, and exhaust braking helps to keep things under control. The LT is ready to pull right out of the box with an intelligent transmission tow/haul mode that reduces the shift pattern when hauling heavy loads, driving down a grade, or, of course, towing. The system is paired with a limited-slip differential that automatically locks wheel slip is detected. Also included is a two-inch receiver hitch, four- and seven-pin connectors, and an integrated brake controller. 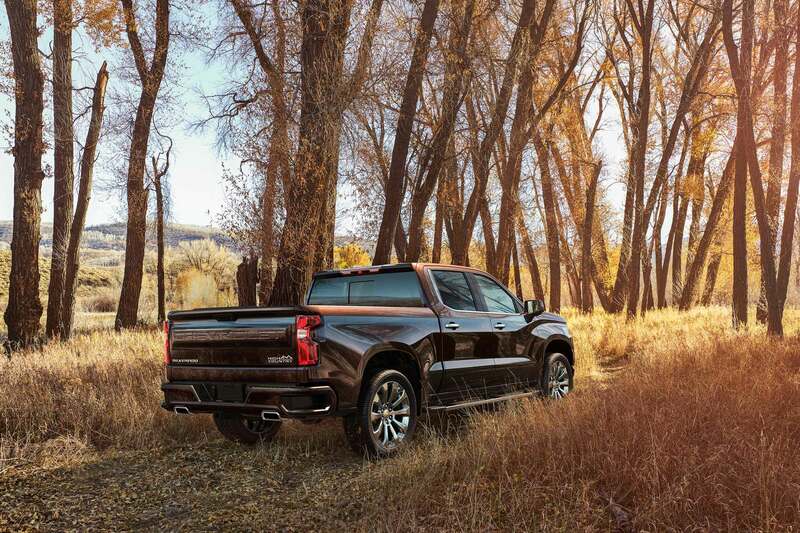 Looking like a Chevy Colorado in an especially snappy suit, the GMC Canyon will also tow an impressive 7,700 pounds when properly equipped. Like its corporate sibling, maximum towing is possible with the optional 2.8-liter turbodiesel ($4,965), available starting in SLE trim. The package also includes the transmission with tow/haul mode, the automatic limited-slip rear differential, two-inch receiver, integrated brake controller, and four- and seven-pin connectors. 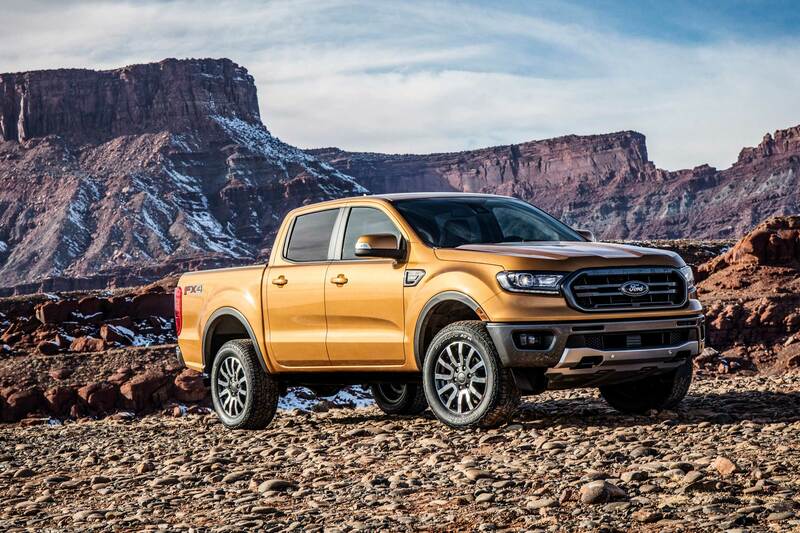 Ford has promised that the hotly-anticipated 2019 Ranger will have best-in-class towing capacity, meaning that it has to clear the 7,700-pound bar set by the Colorado and Canyon twins. Powering the pull will be a 2.3-liter turbocharged four-cylinder with a forged crank and connecting rods for increased durability, a version of which currently lives in the Mustang and makes 310 horsepower and 350 lb-ft of torque. The engine will be paired with a 10-speed automatic transmission, and the combo looks to be beefy enough to live up to Ford’s claim. The best-selling cars in America are full-size trucks, and there seems to be no ceiling on their success. The latest models offer excellent road manners, impeccable refinement, and all the latest amenities and comfort. A rugged frame underpinning construction provides a stout backbone, and many new models make use of lightweight materials and construction methods to maximize their capability. All models are offered with torque-rich engines for pulling power. For drivers who tow often or under less-than-ideal conditions, a diesel might be a sound choice. 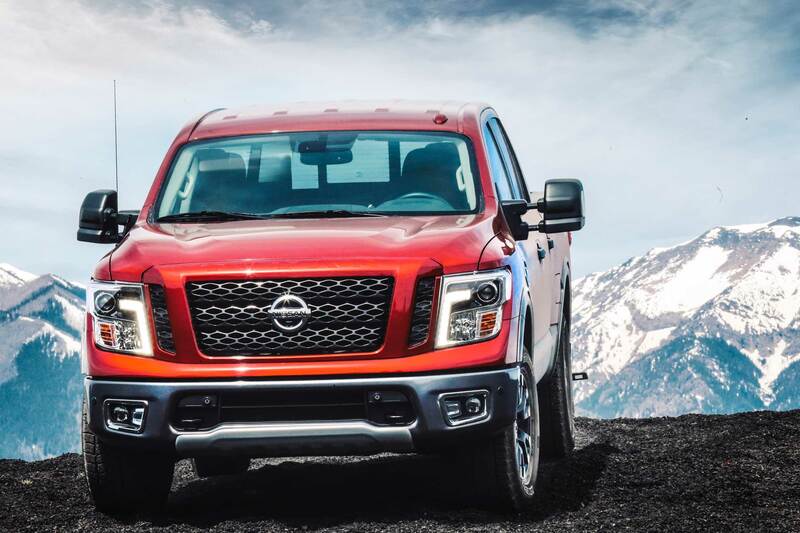 The beefy 5.6-liter V8 under Nissan Titan’s hood makes 390 horsepower and 394 lb-ft of torque, and is paired with a 7-speed automatic transmission. Even in the heaviest of configurations with all the options ticked, towing capacity is still over four-and-a-half tons, more than enough for most tasks. We like the single cab 4×2 SV model ($33,610) for its combination of 9,740 pounds of pulling capacity and available towing options. The SV Convenience package ($845) adds a Class IV tow hitch receiver and four-/seven-pin wiring harness along with some desirable safety and comfort amenities. The SV Tow package ($495) adds heated tow mirrors, a trailer brake controller, and trailer light check, but must be paired with the SV Utility package ($1,145). A Class III hitch ball mount is available for $81. Trailer sway control is standard on all Titans but base S models. 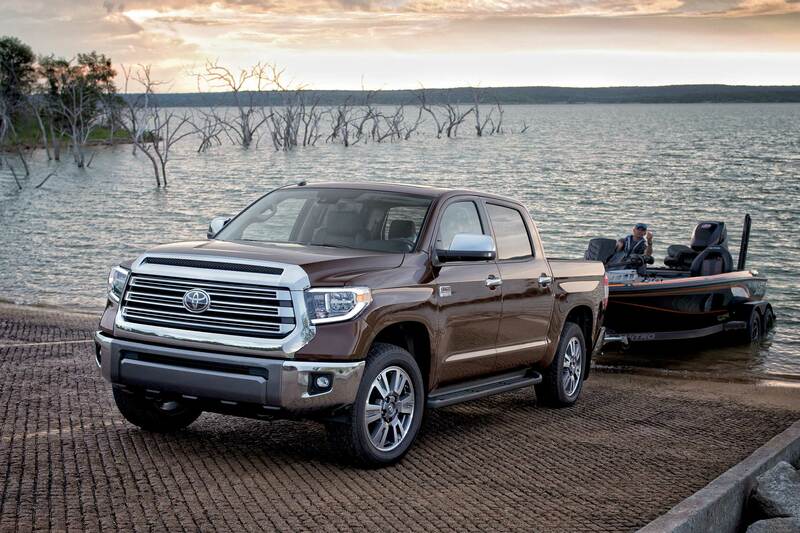 Optimizing the Toyota Tundra for maximum pulling means choosing the 5.7-liter V8, available on SR5 grades ($33,030) and above. The big powerplant puts out 381 horsepower and 401 lb-ft torque and comes standard with a supplemental oil cooler. It’s paired with towing-friendly six-speed automatic transmission with its own supplemental cooler and a transmission fluid temperature gauge. 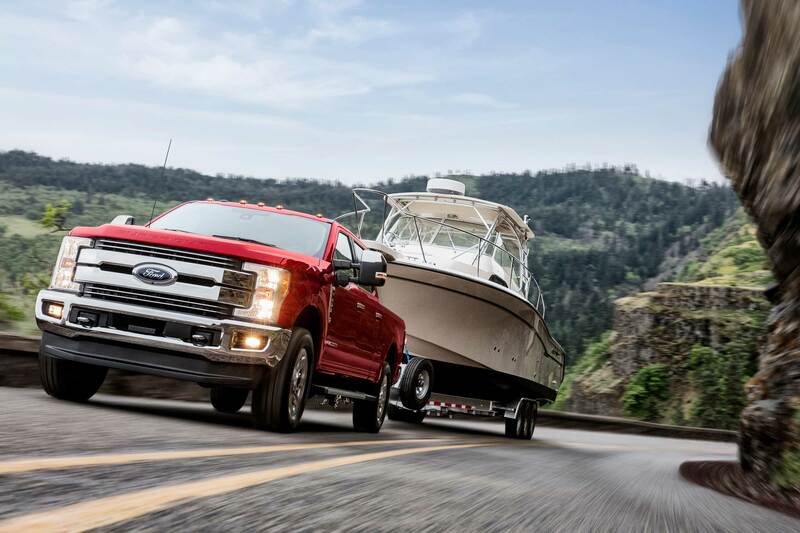 The engine comes with a standard towing package that includes an automatic limited-slip rear differential with a 4.30 axle ratio, a heavy-duty battery with a 170-amp alternator, an integrated trailer brake controller, a four-/seven-pin connector, and heated outside tow mirrors. A hitch ball mount is available for $65. With the new 2.7-liter turbo four-cylinder under the hood, the 2019 Silverado will pull a rather astonishing 7,200 pounds. Start adding cylinders though, and the capacity (unsurprisingly) jumps. The V6 will yank 8,000 pounds and the 5.3-liter V8 11,600. Maximum towing power is found in the 6.2-liter V8, paired exclusively with four-wheel drive and available in LTZ trims ($44,495) and above. Combined with the Max Towing Package (price TBA), the 2019 Silverado will pull the full 12,200 pounds. Chevy has announced a trailering app with a pre-departure checklist and trailer light testing function. An available advanced towing system (TBA) offers an auto parking brake assist, hitch guide with camera, and trailer tire pressure monitoring system. But wait! There’s more! 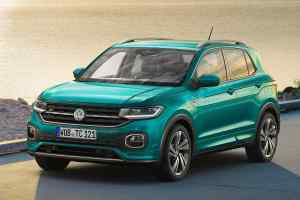 A 3.0-liter inline six diesel is coming early in 2019, but details have yet to be released. 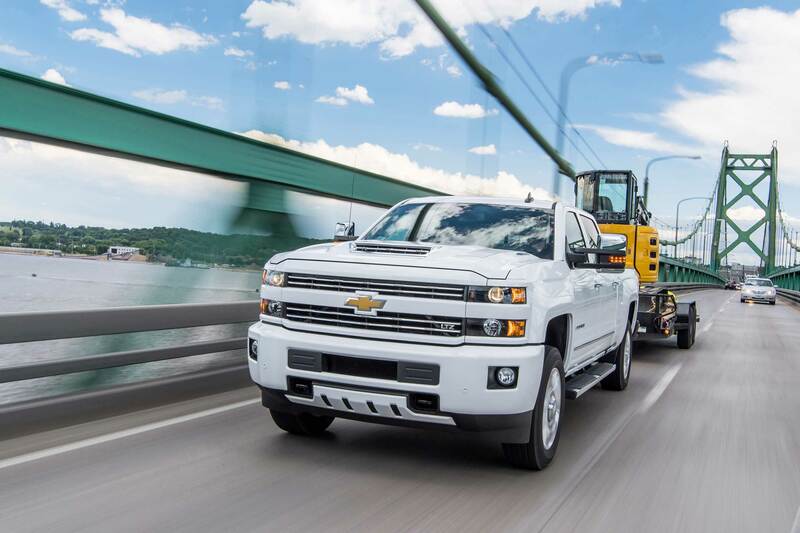 The 2019 Silverado is on its way to dealerships now. 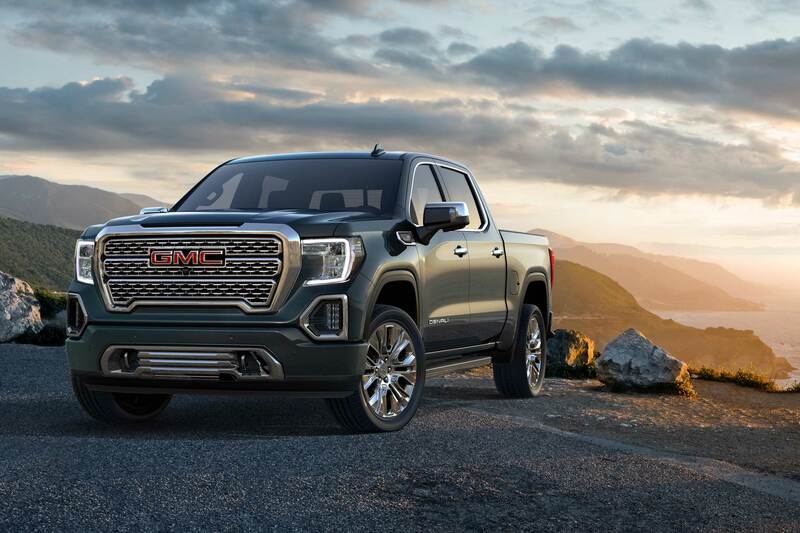 GMC’s handsome new 2019 Sierra is built on the same chassis as its corporate twin, the 2019 Chevy Silverado, and will be offered with the same powerplant options. It’s no surprise then that the two share maximum towing capacities. The same diesel will be offered in the GMC starting in 2019. It also has a trailering system and app, standard on Denali and SLT trim levels. Offered is a hitch view camera with guidance and an auto electric parking brake for positioning. Side view cameras and a trailer-mounted HD camera are available for added driving or reversing assistance. The app features a pre-departure checklist, maintenance reminders, trailer light test, trailer electrical diagnostics, and trailer tire pressure and temperature monitoring. A theft detection system will send OnStar alerts if the trailer is removed without permission. 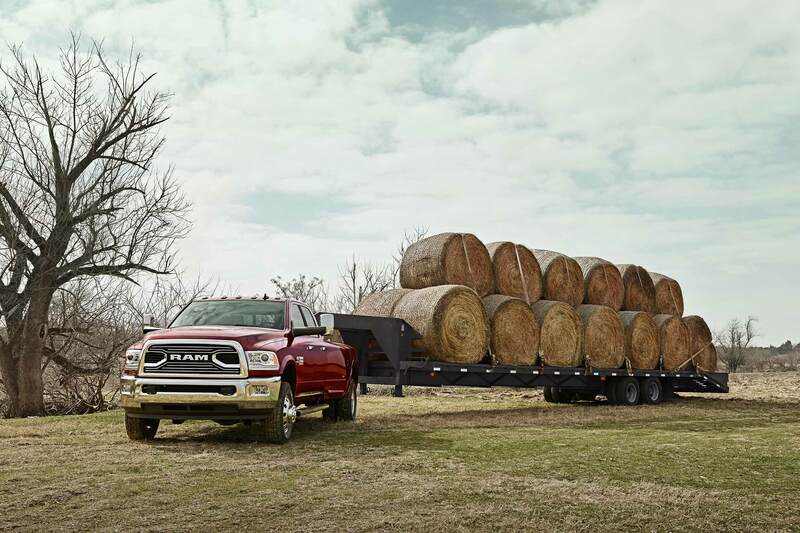 Ram’s 1500 has shed 225 pounds for 2019, thanks to strategic use of high-strength steel, aluminum, and composites. The new frame is both stiffer and more durable, and maximum capacity has ballooned from 10,620 pounds to 12,750 in the rear-wheel drive quad cab with 6’ 4” box. Powering all this pull is the optional 395-horsepower 5.7-liter eTorque V8 ($1,995). The mild hybrid system uses a 48V motor/generator to boost torque significantly when needed, meaning that the available 410 lb-ft is easier to access across a broader rpm range. The other part of the maximum towing equation is the Maximum Towing Package ($1,295). The kit starts with a 3.92 axle ratio for improved grunt, adds a Class IV receiver hitch, powered tow mirrors with supplemental signals, a trailer brake control, and a full-sized spare. Ford’s F-150 remains on top of the full-size pickup towing heap for 2019 (so far). 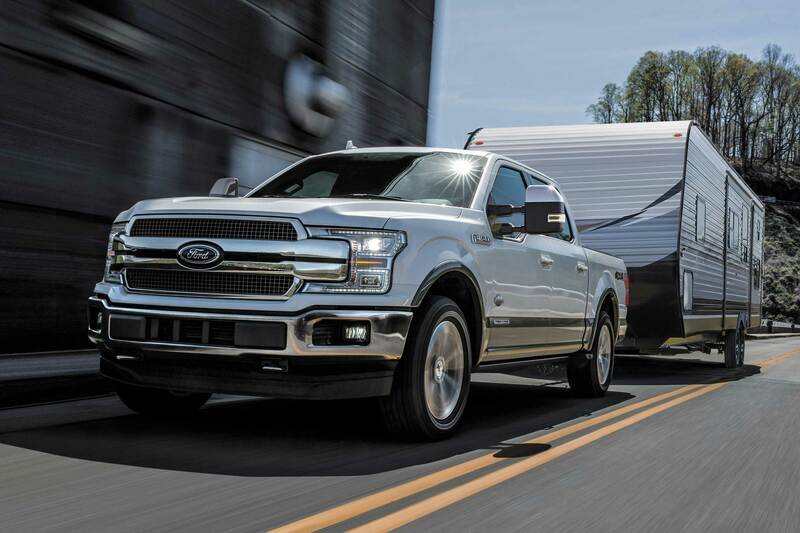 The XL SuperCrew ($34,245) will tow a class-leading 13,200 pounds when equipped with the available 3.5-liter turbocharged V6 ($2,595), and Max Trailer Tow Package ($1,295). 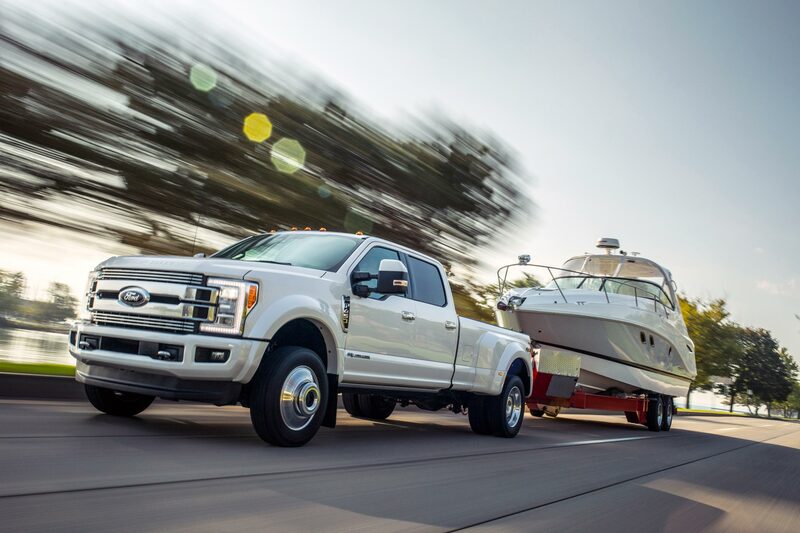 The optional engine puts out a 375 horsepower and a massive 470 lb-ft of torque, even besting its 3.0-liter Power Stroke diesel sibling which makes only 250 horsepower and 440 lb-ft. The V6 is mated to Ford’s 10-speed automatic with tow/haul mode. The max trailering package includes a Class IV trailer hitch receiver, four-pin/seven-pin wiring harness, trailer brake controller, smart trailer tow connector, Pro Trailer Backup Assist with Tailgate LED, a 3.55 electronic locking rear differential, a 36 gallon fuel tank for extra range, an upgraded front stabilizer bar, beefier springs, and an upgraded rear bumper. 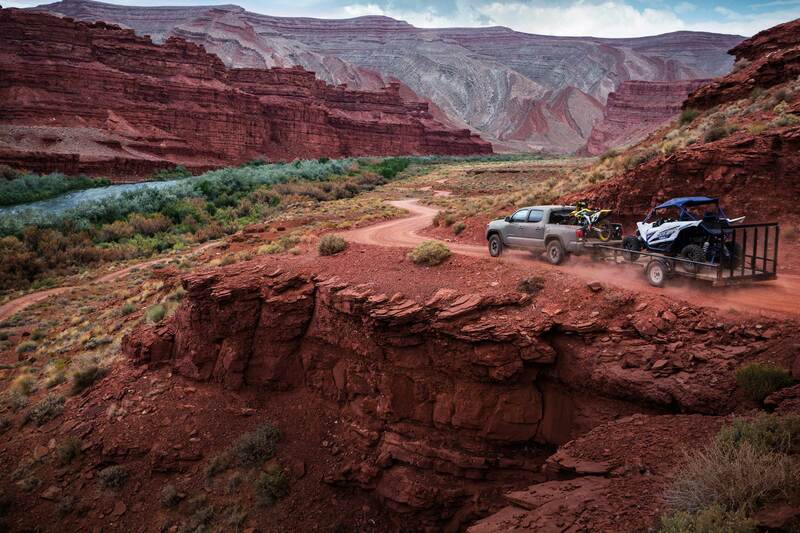 When it comes times to move mountains, these are the trucks for the job. The Nissan XD offers big capacity in base S trim, but we like the SV with the optional 5.0-liter Cummins V8 for bigger jobs. The diesel puts out 555 lb-ft of torque and adds half a ton to capability in a single spec. Standard on the SV ($42,240) are towing features like a Class IV tow hitch receiver, trailer sway control, trailer brake controller, extendable tow mirrors, and trailer light check. There are plenty of towing accessories offered to complete the kit, such as a weight-distributing ball hitch mount ($570) that includes a Class V ball, a factory-installed gooseneck hitch ball and anchor kit ($280), and a dealer-installed fifth wheel adapter ($650). 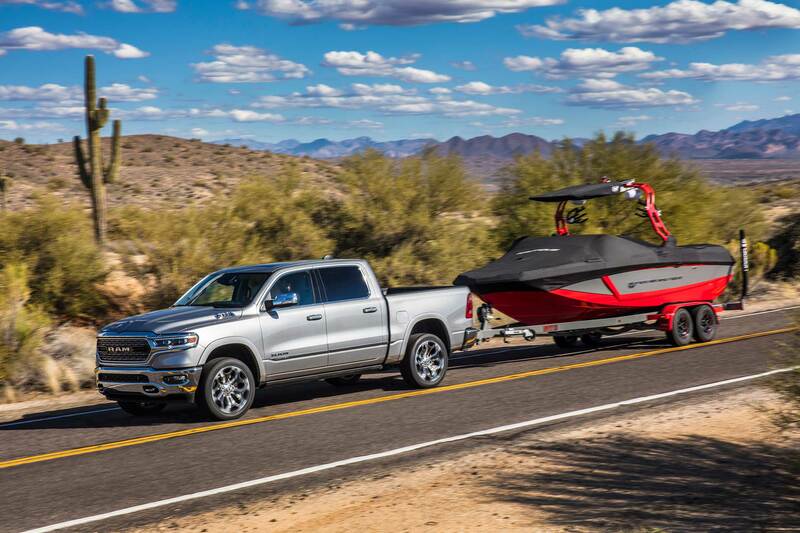 The big Ram 2500 needs very little tweaking to become a towing beast. It comes with a standard Class V receiver hitch and four-/seven-pin wiring harness, and simply adding the available 4.10 rear axle ratio ($145) boosts capacity to 13,900 pounds. But, like most things in life, the fun begins when you start throwing money at it. For starters, add the Cummins I6 turbodiesel ($9,200) with a gargantuan 800 lb-ft of torque, paired with a heavy-duty transmission. Throw in options like as tow mirrors ($145), an anti-spin rear differential ($445), and automatic levelling rear air suspension ($1,695). And then, for serious capability, select the fifth wheel/gooseneck prep package ($495) or 20,000 pound direct-mount fifth wheel hitch ($1,075). An all-new Ram 2500 has been announced and should debut January 2019. 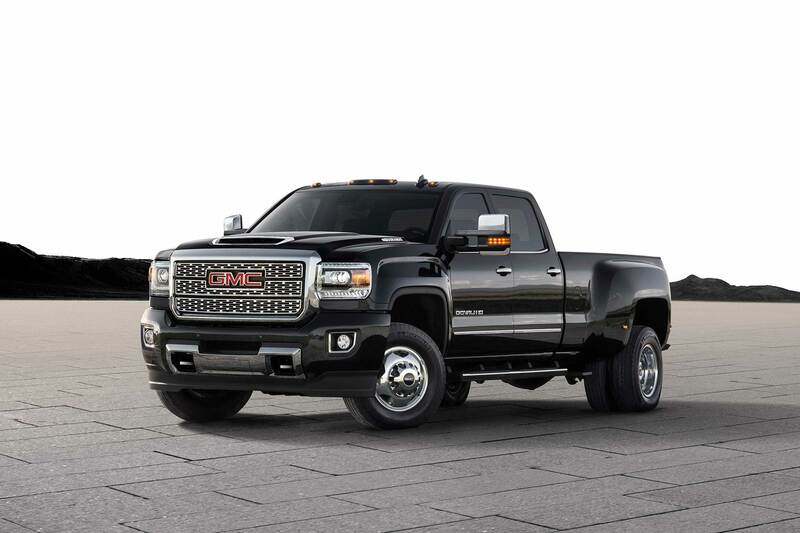 GMC’s big Sierra 2500HD has a powerful 6.0-liter V8 as standard equipment and will pull at least 13,000 pounds in any configuration, and 14,400 in double cab/8’-box form with two-wheel drive. 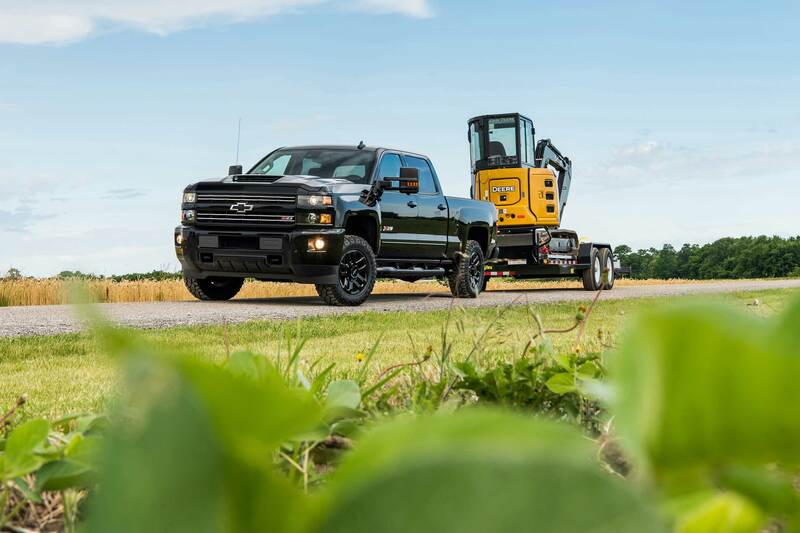 The optional Duramax 6.6-liter turbodiesel with 910 lb-ft of torque can only be added to crew cab models, but increases the maximum towing capacity to the full 14,500 pounds on a conventional hitch and 15,400 on fifth wheel. 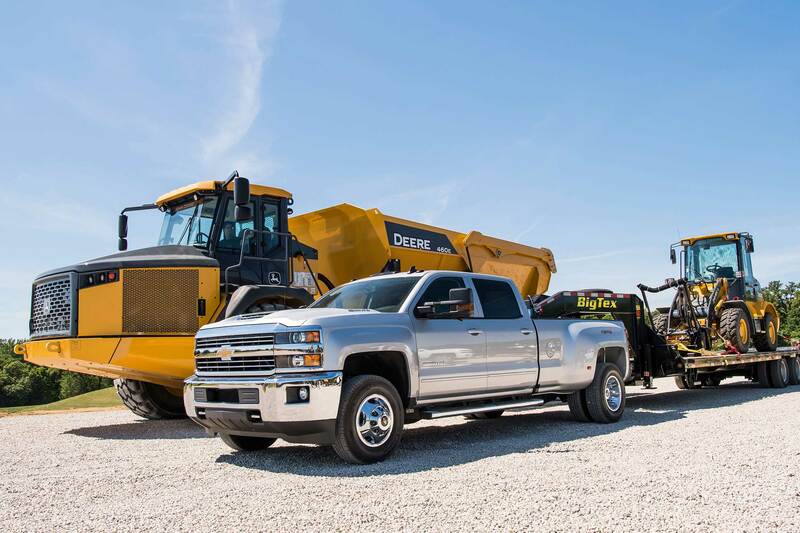 With the Silverado 2500 HD, the big story is the big Duramax 6.6-liter turbodiesel ($9,395) with a gargantuan 910 lb-ft of torque on tap from a low 1,600 rpm. Even before adding the optional fifth wheel/gooseneck prep package, the 2500 will pull 14,500 pounds. With the package installed, the total jumps to over nine tons when installed in a truck with a regular cab. The big diesel is paired with a heavy-duty Allison six-speed automatic transmission, compete with a tow/haul mode to reduce cycling and an exhaust brake for better control when descending steep grades. The base 6.0-liter V8 gasoline engine is certainly no slouch, though. It will also pull 14,500 pounds with a conventional hitch, and 14,800 with a fifth wheel. Ford’s F-250 Super Duty is a towing beast. The optional 6.7-liter V8 diesel ($9,120) puts out 440 horsepower and a mind-boggling 925 lb-ft of torque. For conventional towing, the crew cab/long bed pickup will pull an astounding nine tons, and fans of the fifth wheel can up that number the 18,500 pounds. To reach maximum ability, the High Capacity Trailer Tow Package must be selected ($1,130). It adds a stronger rear axle, beefier hitch receiver, and front and rear springs with higher load ratings. While not necessary for sheer power, we like the optional bird’s-eye view camera and trailer reverse guidance system ($2,605), and trailer blind spot warning system ($1,455). When you feel the earth move under your feet, it’s undoubtedly because someone hooked it up to one of these one-ton ultra-duty haulers. These trucks are so massive that some states and provinces technically require a commercial license to legally drive one while it’s fully loaded. 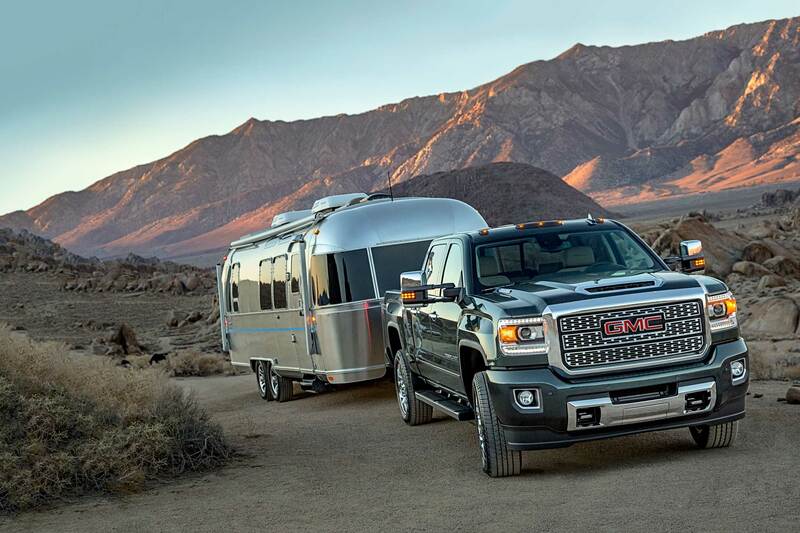 When you want to move mountains and look good doing it, you reach for the GMC 3500HD. 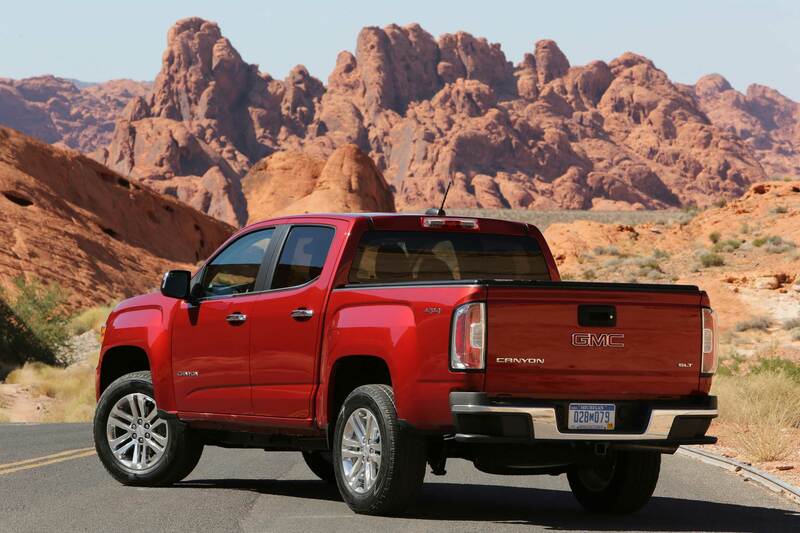 While we love the luxury, fully loaded Denali trim level, it’s only available in a crew cab; the lower Sierra models get the job done. The maximum brawn is available in regular cab spec with an 8’ box and dual rear wheels, powered by the optional 6.6-liter V8 turbodiesel ($9,395). With a 3.73 rear axle selected, this setup will pull 10 tons with a conventional hitch, and over eleven and a half tons on a fifth wheel ($1,539). The 3500 comes with a trailer hitch platform, 4-pin and 7-pin connectors, automatic rear locking differential, and a 7-wire harness with independent fused trailering circuits. 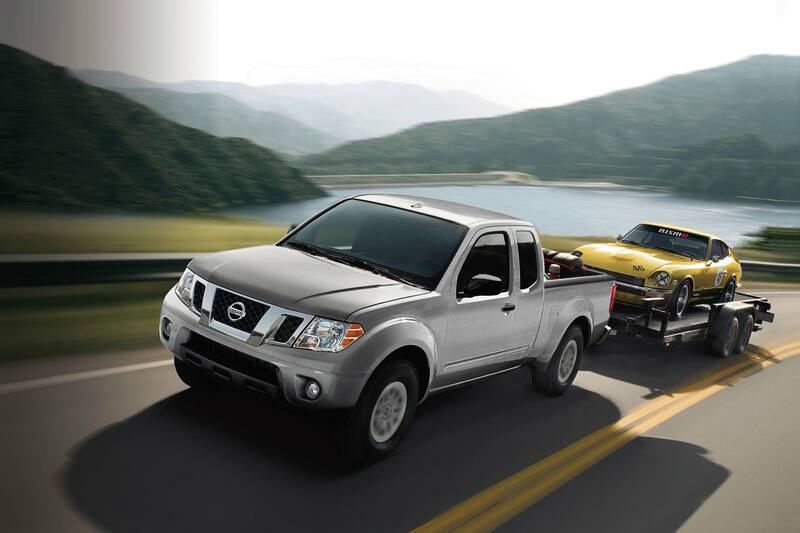 A wide variety of towing hitches, balls, receivers, and safety systems can also be ordered. 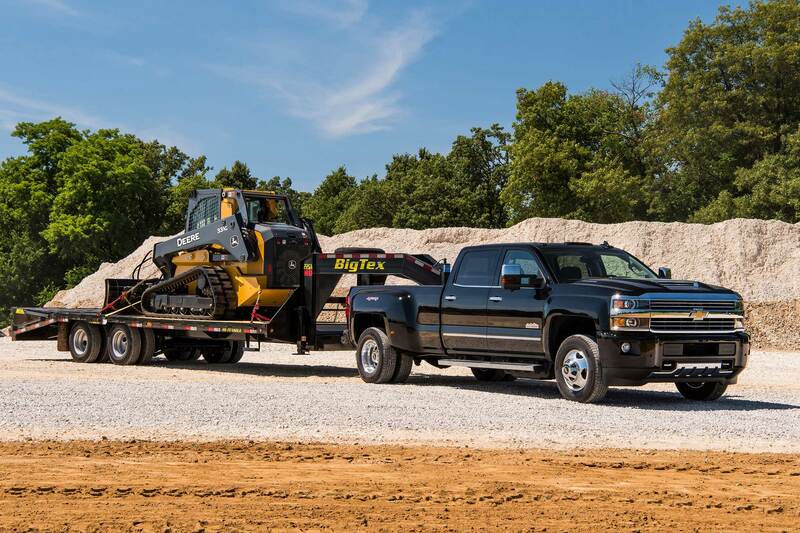 We love the Silverado 3500HD in maximum towing configuration: Duramax 6.6-liter V8 turbodiesel ($9,395), four-wheel drive, dual rear wheels, long bed, and regular cab. It’s like driving a battleship, but, y’know, fun instead of warlike. As has been mentioned one or two times before, the big diesel mill has 910 lb-ft of torque and comes with exhaust braking, helping to keep the big rig under control on grades. Stability and traction control are standard, helping to keep the trailer in line. The fifth wheel prep package is necessary for ultimate towing ($1,539). Powering the ultimate Ram towing machine is a 6.7-liter Cummins I6 twisting out a bone-shattering 930 lb-ft of diesel torque when paired with a heavy-duty six-speed Aisin transmission. Add in a regular cab, long bed, and dual rear wheels, and the Ram 3500 will draw 31,210 pounds. The optional powertrain does add $11,895 to the final price of the truck, but any arguments contrary to its addition can be settled with the words “930 lb-ft of torque.” Enough said. In order to handle the immense load, we added Mopar’s Max Tow package ($3,500) with a 30,000 pound fifth wheel hitch, self-leveling air suspension, trailer brake control, and a 4.10 axle. 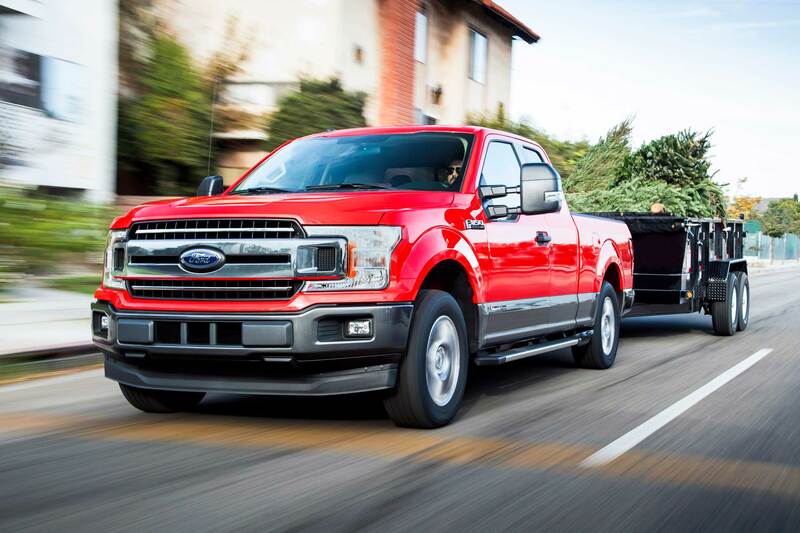 Ford’s F-350 is powerful, but adding the 6.7-liter V8 turbodiesel ($9,120), dual rear wheels ($1,490), and 4.10 limited slip axle ($360) allows is to pull an eye-watering full sixteen tons on a fifth wheel. That is a full country music song worth of towing prowess. The 350 comes with an integrated brake controller, towing mirrors, a beefy hitch receiver, and 4-/7-pin wiring harnesses. In order to keep things under control we added the Ultimate Trailer Camera tow system ($1,880) with a 360-degree camera with reverse guidance, a boon to backing up a long trailer. A blind spot warning system with rear cross traffic alert ($1,665) is also available, and is calibrated for trailers up to 33 feet long.